After earnings, Coach CEO Victor Luis discusses Amazon, retail and Kate Spade. 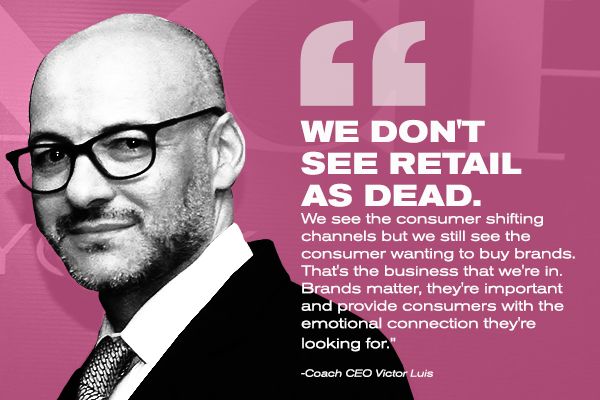 Coach Inc. (COH CEO Victor Luis is not intimidated by Amazon.com Inc. (AMZN - Get Report) and he surely does not view retail as dead. At least that's what Luis told TheStreet in an interview on Tuesday, Aug. 15, after the luxury handbag and accessories maker reported second-quarter earnings of 50 cents a share on revenue of $1.13 billion, compared to Wall Street's estimates for earnings of 49 cents a share on $1.51 billion in revenue. The company's same-store sales rose 4% in North America. Shares of Coach slipped nearly 10% in afternoon trading as Wall Street was likely looking for more optimism with guidance now that newly-acquired Kate Spade & Co. will be in the mix. 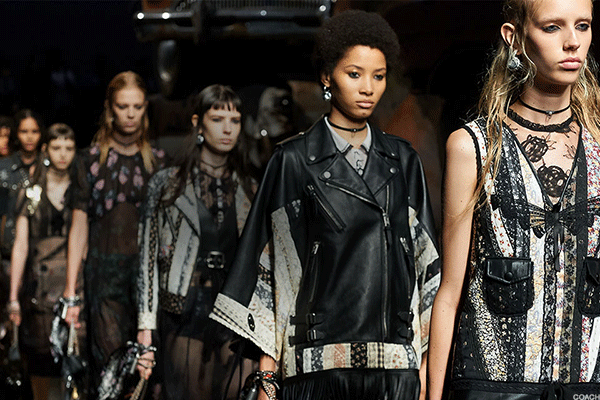 Coach sees full year earnings of $2.35 to $2.40 a share, an increase of about 10% to 12% from the prior year. Analysts were looking for $2.49 a share. Coach closed on its $2.3 billion acquisition of Kate Spade in July. Here's a condensed and edited version of our interview with Luis. Question: It seems like every day in the last month we've written about how online retailer and Amazon is killing retail. But, that doesn't show up in your results. What are people not getting with the Coach story? Answer: We are a multi-channel company and we sell to consumers where they prefer to shop. Whether that be digitally on our own website or on premium third-party partners' websites or, yes, with some online-only digital players that exist. We're not focused on the Amazon effect. Our business is about brand. Price and convenience are not the main drivers. People decide to buy a brand because of an emotional connection they have to it. That emotional connection comes through great design, quality, product, marketing, digital and bricks-and-mortar experiences. We make clear decisions on which channels we prefer and which distribution partners we want to be with. Decisions that include pulling out of our own flash-sale business and tremendously reducing Kate's flash-sale business. We are in this for the long term. Q: In the first month of working with Kate Spade, did anything surprise you in who you found Kate Spade's customer to be? A: No, it was really all about opportunity. Our earlier research really has just been confirmed in this initial month that we've been working closely with the team. First and foremost, they have a very strong positioning with millennials, representing about 60% of their customer. Secondly, they own key emotional attributes, specifically feminine, fashionable and fun. Those three are very important in Kate's brand perception and how we translate that globally. What we also saw that we're excited about is an incredibly loyal customer that is shopping across categories. The brand does well in most fashion categories, some at higher levels of penetration than what we've seen with the Coach brand, for example in ready to wear, in tech product, which is everything from Apple (AAPL - Get Report) iPhones to iPads, as well as Samsung and other tech products. It also does very well in fashion jewelry. We're incredibly excited about that multi-category lifestyle strength. Q: When you are making the decision on which executives to bring over from an acquired company, what qualities do you look for? A: It depends on the role, but we're always looking for, first, great leaders who understand the importance of talent and know how to motivate, choose and engage with talent effectively. That's vital. Secondly, we look for leaders who understand the importance of brand. And thirdly, we look for leaders who have the competency and technical skills where we're putting them. So, in marketing, the person must have great product instincts and analytical skills to understand what is happening in stores. In finance, of course we look for people with technical finance experience. Those are the three areas that are absolutely vital for us strategically as we think about senior talent. Q: Macy's Inc. (M - Get Report) , on its recent earnings call, talked about how it is already preparing for the fourth quarter, the holiday season. How are you preparing for it? A: At the moment, we're focused on the product assortment. We're very excited about what we have from an assortment perspective across all of our brands, and obviously, depending on what happens from a promotional perspective, we will need to adjust. But in principle, I would say for us, the trends that we've noticed in bricks-and-mortar especially, but online too, Black Friday and the week after Black Friday and the week before the holiday itself being the most important. Then how we engage the consumer through those two periods makes a very big difference. Joshua Schulman, president and CEO of the Coach brand, who was sitting in on the interview, added that in terms of product assortment for the holiday season, "gifting and self-gifting" is a primary focus. Q: Recently credit card debt topped $1 trillion, but it seems that people are still only cautiously buying luxury handbags. What is your sense of the consumer right now? A: Overall, we see, across channels and categories, and obviously across price points, the consumer continues to be very robust. A lot of what we hear is the digital impact, impact across channels. And too often that is being translated as retail is dead. We don't see retail as dead. We see the consumer shifting channels but we still see the consumer wanting to buy brands. That's the business that we're in. Brands matter, they're important and provide consumers with the emotional connection they're looking for. What we focus on most is our need to continue to innovate and surprise and delight consumers and that's our main job. Whether that be with Stuart Weitzman, Coach or Kate Spade. Editors' pick: Originally published Aug. 15.